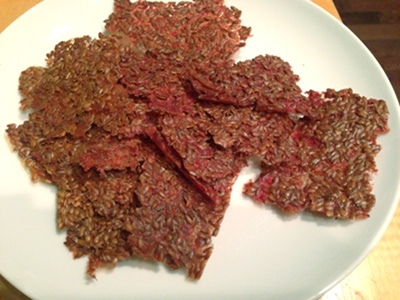 One of the most common raw vegan recipes is for basic raw flax crackers. You'll see them on the menu as appetizers at raw restaurants, and bloggers are always offering up new versions that you can make at home. But, are they actually easy to make, and do they even taste good? While I don't follow a strictly raw diet, I do eat quite a bit of raw food in the form of fruits, vegetables, and nuts. And, I love going to raw vegan restaurants to check out the amazing things chefs can make with uncooked food. Think amazing "cheesecake," mousses, soups, and even mushroom "bacon." I love the boxed raw crackers that you can buy in grocery stores, but let's face it... they're super expensive. It took me a long time to decide to make my own crackers because I thought it would be labor intensive and I assumed mine would cost just as much, so it seemed easier to just buy them. It turns out I was completely wrong- this flax seed recipe is easy, quick, cheap, and really tasty. And, it made a ton of crackers; enough to fill a large Ziploc bag. My flax crackers ended up with a spicy, salsa style flavor and they have a nice crunch from the whole flaxseeds. They're sturdy enough to hold up to a thick hummus or even to be spread with jam or vegan cream cheese. You can also play around with the spices and make completely different flavors of dehydrated crackers- anywhere from spicier and cheesier (think nutritional yeast and miso paste) to a sweet version with cinnamon and maple syrup. Flax is packed with nutrients and healthful properties like omega-3 fatty acids, antioxidants, fiber, and estrogenic qualities, which all together means it can help you prevent heart disease, diabetes, and stroke (according to webmd.com), as well as lower cholesterol, reduce inflammation, and put an end to depression. Flaxseed also helps your body to move food through the digestive system more efficiently, so if you have trouble going to the bathroom, add some flax into your diet. One of my favorite benefits is that it can help improve your complexion. When I first went vegan, I noticed my skin started going crazy. I tried every lotion on the planet and nothing helped, so I realized it was hormonal and not an external problem. After a quick internet search, I realized that I might have cut out too many of the good fats in my diet and made my balance of fatty acids go off kilter. I started adding a tablespoon of flax meal into my daily diet; either in oatmeal, cereal, salads, or smoothies. Within a week my skin was back to normal. My mom gave us the best dehydrator (the Excalibur) as a wedding present, but the first few times I tried to use it, I made a huge mess, so it has spent a lot of time sitting around waiting for me to take more of an interest. Well, I finally figured out the problem... I wasn't using the Paraflexx sheets that line the drawers, and that's why liquid was spilling all over the place. I tried using regular silicon mats, but they have to be the perfect size so nothing falls over the edges. I've also read reviews of the generic brand dehydrator sheets, and people say they don't work as well as the premium Excalibur brand sheets. This is one of those times where quality prevails over simply buying based on price, for me at least. If you don't have a dehydrator, you can dehydrate food in your oven by setting the oven to its lowest temperature (should be around 140 degrees) and allowing the door to stay slightly open so air can circulate through and the oven itself won't get very hot. Combine all the ingredients in a bowl and stir to make sure it's all mixed together. If you want a thicker cracker without visible flax seeds, you can put the mixture in the blender until it's all combined. Pour the flax crackers mixture onto your dehydrator sheets, trying to pile the edges with slightly more than the middle (the middle takes the longest to dry) and dehydrate the raw crackers for 12 hours at 115 degrees, flipping them halfway through. If you prefer to use your oven, set the temperature as low as possible and place the mixture on a cookie sheet with edges. I still like to use a silicon mat to make it easier to remove the crackers when they're done. 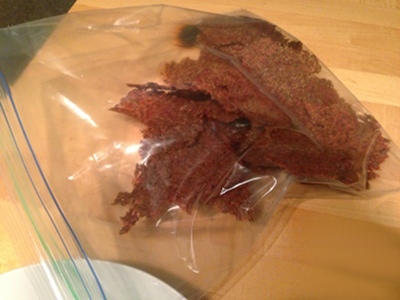 Leave the oven door slightly open and cook the flax crackers for about 8-10 hours, flipping halfway through. Check out Sweet Gratitude, the raw dessert cookbook written by the owners of the famous Cafe Gratitude, based out of San Francisco. Use flax seeds as a replacement for eggs in hearty baked goods. Learn more about flaxseeds as super foods. Thought the idea of raw mushroom bacon sounds cool? Taste it for yourself at Plant in Asheville, NC.